Do You Have A Patio That Needs An Equinox Louvered Roof? An Equinox Louvered Roof complements your outdoor environment if your relaxing or entertaining. The louvers are remote operated and move with the touch of a button. You can allow full sunshine, filtered shade, or close the louvers to provide solid rain protection. They are ideal for any home or business and built to last. Our louvered roof system is both strong and dependable. Made from extruded aluminum, the Equinox Louvered Roof provides great durability compared to traditional patio covers. Unlike plastic or fabric, our louvered roof will perform in the cold, heat, or rain. 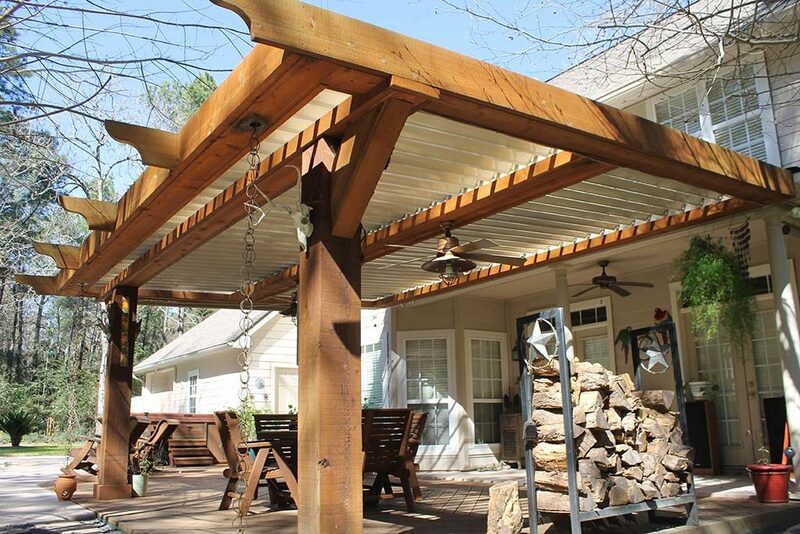 These are not your typical patio cover, they are game changers when it comes to utilizing your outdoor space. Pergolas can offer upto 85% shade when built right but offer zero protection in the rain. Sure they look pretty, but only on a sunny day. Traditional or solid patio covers are great for 100% shade and protect you during the rain. Sounds better right? On a hot summer day in Texas though they also protect you from the breeze. 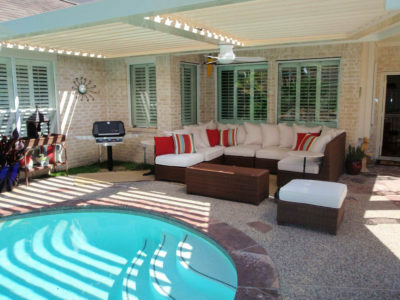 These patio covers usually require ceiling fans for any significant air movement. An Equinox Louvered Roof is the answer that solves all your weather related issues. Open and close them with the touch of a button and in seconds you have the ultimate performing roof in any Texas weather. Equinox Louvered Roofs can be customized to match about any architectural style. The louvers themselves are substantial, and come in three color choices White, Sandstone, or Clay. 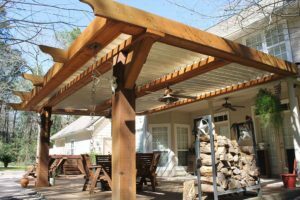 The supporting frame and beams can be customized with any colors to complement your home. Does the classic look of rustic cedar appeal to you… We can do it. Modern clean lines are available too. We can build each Equinox Louvered Roof to match the look and feel of your home. 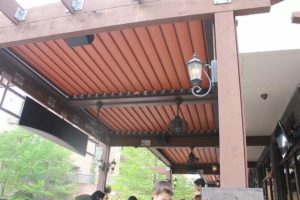 Finally there is a Louvered Roof System that lets you completely control your outdoor space. These patio covers are fantastic. Just click the remote and you can control full sun or close it for solid watertight roof. 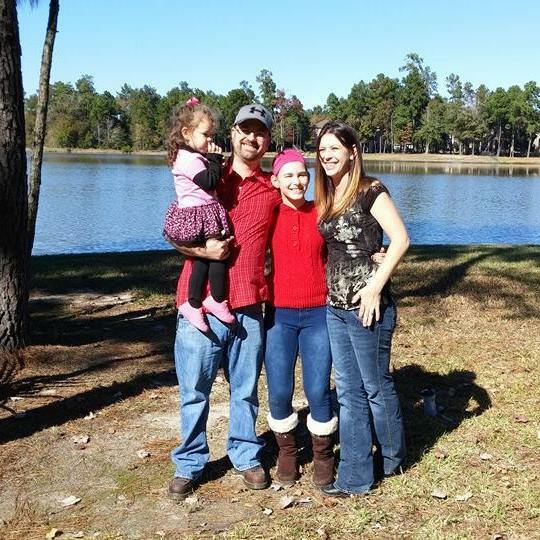 We have tons of satisfied clients that are happy for us to show off their Louvered Roofs. 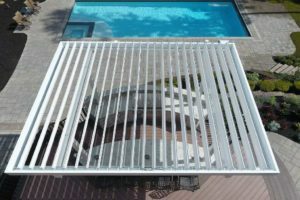 What are the benefits of an Equinox Louvered Roof? 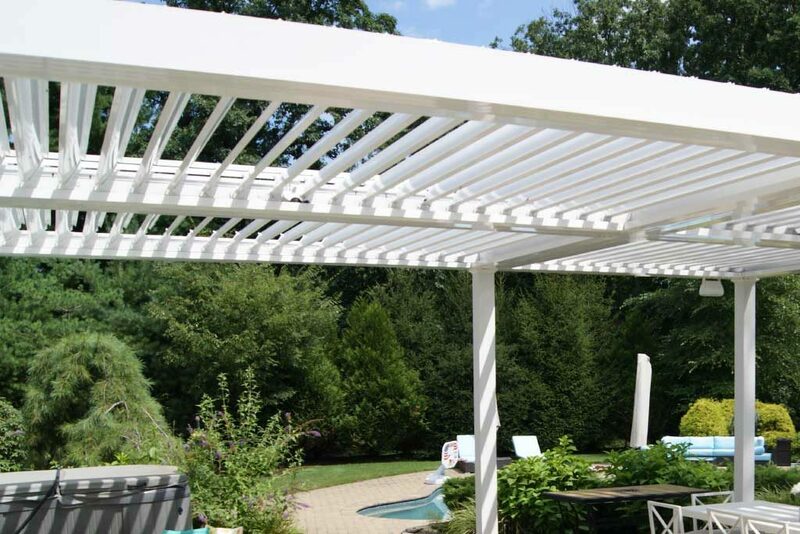 An Equinox Louvered Roof increases comfort by maximizing functionality in your outdoor space. 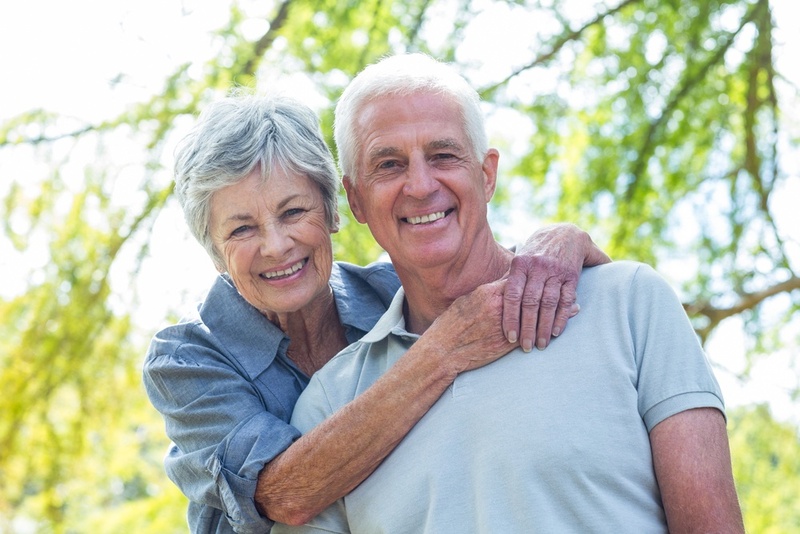 Both homeowners and business owners enjoy increased usability. The fact that the louvers are adjustable means you can dial in the perfect amount of sun or shade. If it rains close the louvers in seconds for full protection. On a hot summer day you can open the louvers for ventilation and sunlight. Closed Louvers provide 100% shade which can also help reduce interior cooling costs. Equinox Louvered Roof Systems provide ultimate flexibility. The solar powered motors are energy efficiency. A remote control makes operation easy. 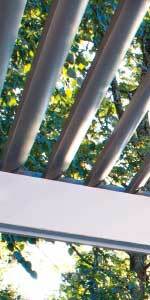 Equinox Louvered Roofs manufactured from extruded aluminum and built to last. 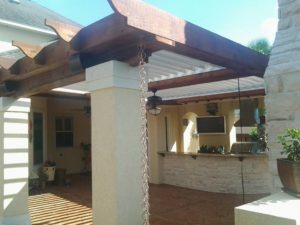 This durable roof system is Miami-Dade County approved and TDI approved here in Texas. All this engineering means Equinox will withstand our local elements. Another benefit is aluminum is low maintenance only requiring occasional cleaning. The versatile design allows for studio or gabled roof options. This complements any architectural style or design. How does The Louver Roof System Work? Equinox Louvered Roofs contain louvers or blades that rotate within a fixed frame. Driven by a solar powered motor, the louvers rotate in full unison. This allows for the desired amount of sunlight, shade, and ventilation. In the closed position, the interlocking louvers create a watertight seal. Where does the water go? Great question… The louvers have a slight pitch that directs water into a gutter and downspout system. This channels rainwater away from the covered area. The typical Residential Roof System uses a rechargeable solar powered battery. The system operates with a remote control and requires no wiring or power from the home. Commercial Roof Systems can be quite large. Depending on the roof size, they use one or more toggle switches located near the patio covered area. These motors are powered by a transformer connected to a regular 110v outlet. Where do you install Equinox Louvered Roofs? 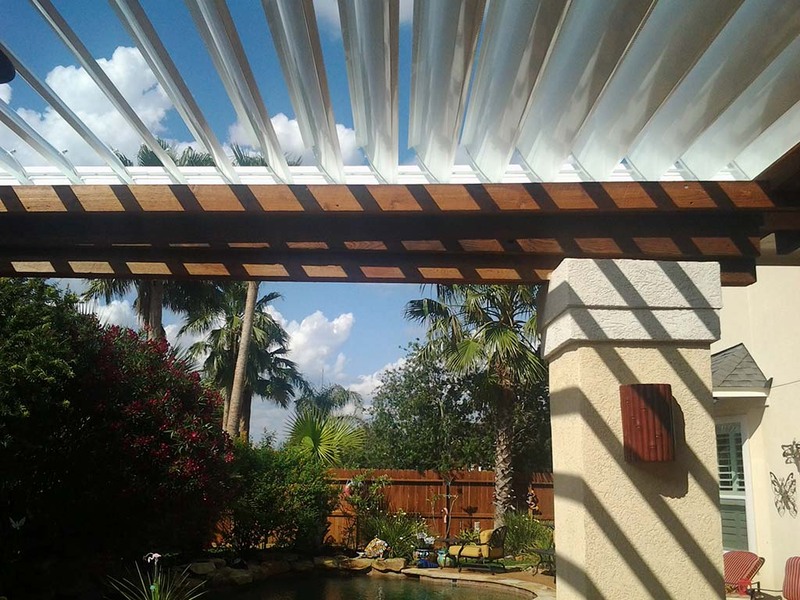 Equinox Louvered Roof systems are perfect wherever you need sun, light, and weather protection. 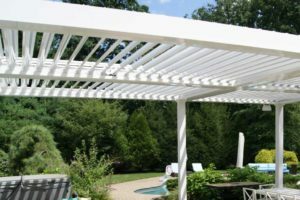 Equinox Louvered roofs are designed to enhance any outdoor lifestyle. We build the roofs as a free-standing system or attached to your existing structure. Check Out Our Equinox Louvered Roof In Action! With hotter and wetter extremes in weather, having a quick and easy way to shelter from these conditions is important. 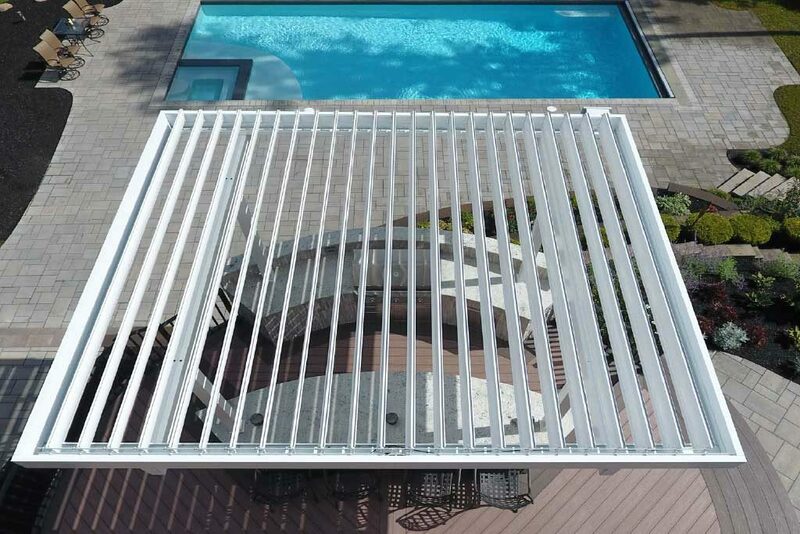 Equinox Louvered Roofs are the premier motorized patio cover that creates the ultimate flexible patio space. With the flip of a switch the louvers can be fully opened, partially opened, or completely shut. The equinox louvered roof system is the perfect solution for people that want to enjoy their outdoor living space. It allows a homeowner, or a business operator, the ability to set the louvers where they can have sunshine when they want it. They can have shade went ventilation when they need it. Also if it starts to rain they can close them and not get wet. These automated roof systems harness the sun’s energy to open and shut. They manage rain through an integrated gutter system. Now homeowners and business owners can make plans knowing that their equinox roof will keep them dry. Certain times of the day you might get direct sunlight on the patio. The easiest thing to do is just press the button and the equinox roof will shut. Creating instant shade and keeping you cool outside on the patio. There roof systems allow you to use your outdoor space when you want to. Most people don’t use their patios or decks very often because the weather just doesn’t allow them to. The heat and the rain keeps them indoors. The equinox louvered roof system solves all that. This automated patio cover is a game changer solving problems that tradition patio covers and screen rooms can’t. The louvered roof doesn’t block light into the home which is a big concern with many homeowners. The equinox system is designed for looks and performance. Air passes over the louvers creating a cooler environment. The equinox roof system is completely customizable. The louvers rotate inside a fixed frame. This means that the frame and beams can be customized to match any architectural design. We can match columns, wrap in cedar, even stucco. More than ever, today’s property owners demand flexible modern solutions that match their style and aesthetic, increase usable living space, and last for years to come. Equinox louvered roof deliver a customized outdoor lifestyle regardless of the weather. 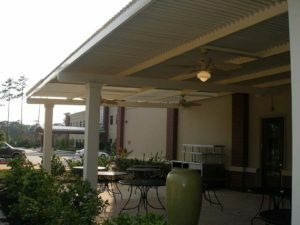 From residential spaces, to commercial businesses, Equinox louvered roofs are the superior patio cover. 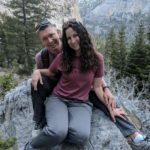 Check in with us for pictures and descriptions of our latest projects. 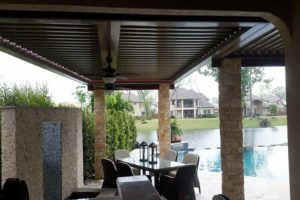 We will post weekly photos so you can keep up with some of our Louvered Roofs in Houston. This Equinox Louvered Roof is in the Woodlands. It's a very poplar restaurant you might recognize! Houston Louvered Roofs are amazing. Actually the very best on the market. Our Patio Covers open and close giving you full control of your outdoor space. Rain or shine they keep you comfortable!